Sibylle has been entertaining audiences with stories for just about as long as she can remember. 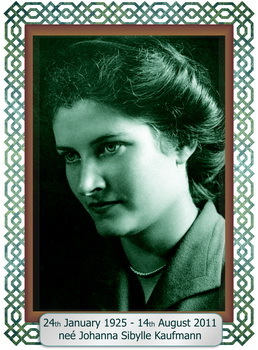 After the war she was invited to host a children's programme on German radio and later, in Britain she wrote three school readers, the adaptation, "Das Doppelte Lottchen" (a story known to many as, "The Parent Trap") "Flucht und Heimkehr," ('Flight and Homecoming') an advanced German Reader based on her own war-time experiences, and, "Jetzt Geht's Los," ('Now It Starts,') fiction. Current publications include four anthologies of Celtic stories, "Told By The Peat Fire," published in both English and German ("Am Torfeuer Erzahlt"), and, "Der Monch Aus Iona" ("The Monk From Iona"), "Der Harfenspieler" ("The Harp Player"), and, "Das Findelkind" ("The Foundling") published in German only. Sibylle was often to be seen, and heard, at the "Guid Crack Club," Edinburgh's foremost storytelling centre. Over the past thirty years Sibylle visited cities in several countries holding seminars and giving talks on Celtic themes. Seven journals regularly published articles, reviews and letters which were read throughout the English and German speaking worlds. Sibylle Alexander died on Sunday 14th August 2011 while leaving St Peter's Church, a place which meant a great deal to her during the last quarter century of her life. "Der Monch Aus Iona" (ISBN: 3-88069-352-8), "Der Harfenspieler" (ISBN: 3-88069-367-6), and, "Das Findelkind", available from J. Ch. Mellinger Verlag GmbH Stuttgart "Das Doppelte Lottchen" by Erich Kaestner, adapted by Sibylle Alexander, currently out of print. Known in English as the film, Parent Trap, "Flucht und Heimkehr," and, "Jetzt Geht's Los" are both currently out of print. "Der Mönch Aus Iona " (ISBN: 3-88069-352-8), by Sibylle Alexander. 11.30 for 12 noon All are invited to St. Peters Church Hall for refreshments. As her eldest son I want to share a few of the many stories about my mother to give a deeper understanding of her life. After the burial and the soup, you are warmly invited you to tell your stories about your experiences of Sibylle, but I hope I can give you a sense of the sweep of her life, from her origins in Hamburg to her home here in the Scottish Borders. Our mother was very proud of her ancestry and of her family of five children, 13 grandchildren and one great grand-daughter, Mimi. Mum came from two old North German families. Her mother, Rita Tesdorf, was the daughter of a sea captain from the Baltic, from the famous Tesdorf family in Lubeck, where they were prominent citizens for several generations and featured in Thomas Mann’s novel Budenbrooks. Her father Johannes Kaufman was the only son of an eminent Professor of History. His family also traced their line back for many centuries. One of her relatives had married on of the story-telling brothers Grim, who were an inspiration to her. One of my fondest memories was snuggling up on my mothers knee, demanding story after story from the great big book of Grim’s fairy tales. Her father became a Labour judge in Hamburg, arbitrating in industrial disputes. She was the fourth child of five, although one brother had died at four before she was born. They lived in a large house on the outskirts of the city, with servants, a big garden and lots of freedom. The Nazi’s came to power when she was eight. Her father lost his job and home because of his Liberal political beliefs, and life became very hard for the family, but her childhood was happy because her parents protected and encouraged her. Apparently they didn’t allow her to do any house work or cooking or chores, which her mother did, because they wanted her to study and have the opportunities her mother never had. Her experiences of war strengthened her deep commitment to liberalism, peace, freedom and understanding between people. These were not slogans to her, because she knew what the opposite looks like. She was forced to work in a munitions factory. Her beloved older brother Georg and sister Margaret were killed. Their country was destroyed, her family lost their home a second time and people were starving. Sibylle was 20 when the war ended. She had an opportunity to go to Sweden on a one year programme to train as a youth leader and learn how to live democratically as a community, run by the Lutheran Church, which was another profound experience that shaped her life. She returned to Germany to study theology, philosophy and literature in Tübigen, where she met my father in 1949. He was also studying philosophy, one of the very few non-military British people in Germany, and he was lucky to meet such a beautiful, talented and intelligent young woman to teach him the language and culture. About 10 years ago, over a long weekend between Christmas and New Year, my mother took me by bus and boat to see the Standing Stones of Callanish and other ancient monuments on the Isle of Lewis. On the bus she told me the whole story of how they met, studied together and started a complicated conversation that lasted five decades. I was an accidental by-product and her parents were furious when they heard she was spurning many eligible admirers to marry some other-worldly man from Newcastle. And I can’t say the Alexanders where too happy about it either, but marry they did. My mother told me how, still in Tübigen, they saw happy and joyful children coming home from school, and wanted to know what the secret was. So one day she followed them to discover Waldorf education, Rudolf Steiner and anthroposophy. This became the guiding light for the rest of her life. For her, the Christian Community literally saved her life at least twice. Her health had been seriously damaged as a result of handling chemicals when doing forced labour in a bomb-making factory. After the war doctors said there was nothing they could do for her, but one recommended the Christian Community and my mother says that this saved her life. A second occasion was in Edinburgh, when things were very bad in her marriage and the priest gave her confidence and support to continue. But that was later. My parents studied Steiner’s philosophy together and moved to Edinburgh to teach at the Steiner school there. Meanwhile, they had three children. Boys. Marius and I were born in Germany, and Geoffrey was an unexpected surprise a few months after they arrived in Edinburgh. For several years we lived in a small farm cottage at Fairmile Head. My parents did their teacher training at Murray House and taught briefly at the Steiner school. They were in their thirties, had no money and relied on child benefit, their own vegetable patch, bee hives and my father’s ability to shoot wood pigeon and rabbits to survive. I have very fond memories of the freedom of the farm, but life for mum was a struggle. She often said she knew nothing about mothering and house-keeping, but she threw herself into everything she did and read the books and worked tirelessly to bring up a family which soon grew to five, teaching German and writing stories. She sacrificed her own ambition so that our Dad could write and take part in the Edinburgh poet’s circle. But she was the one who over time got nine books published, and may of you will know just how pushy she could be when selling them. When Oona and I got married nine years ago, my mother sold several books to other guests during the reception. My parents moved to Morningside with help from her father-in-law. She once told me that one of the questions middle class parents ask each other in Morningside is "And which school do you send you children to, Mrs Alexander?" When my mother told them the Steiner school, she said "But they dinnae conform" To which my mother said "That's why I send them there." Mum believed passionately in education of the whole child and campaigned tirelessly for nature kinder-gardens for young children and to raise the school starting age to six, as some of you were badgered to support, but one day she will be vindicated. In later life my mother also developed an extra-ordinary career, which consisted of writing articles, book reviews and letters to the paper, giving talks about Celtic mythology and all kinds of subjects, mainly in Germany, and selling bits and pieces of tartan fabric. Some people found it embarrassing, but she simply wanted to make ends meet and be able to buy things for the family. She was always notoriously bad with money and gullible to all kinds of conmen who swindled what little she had from her. But the most important thing of all in Mum’s life was family. I can remember the excitement when any one of us looked like we were going to get married or have a child. When she heard that Akira, her first grandson, was about to be born, she jumped on her bicycle and cycled to the hospital to be there. When Seline was born here in Galashiels, Mum often come down from Edinburgh by bus to look after her while Rosy was studying. Often she stood at the road side and hitched a lift back. When my father retired my parents moved to Galashiels to be nearer Rosy and help look after Seline. Sibylle embraced her grand-daughter with love. She adored Seline. When Ruth married a priest she couldn’t have been happier. Everywhere my mother was, she became deeply and passionately involved in what was going on. In Edinburgh she was involved in the Allotments Association, in the school and activities I know little about, like the Psychic Society where she lectured. In the Borders she was involved in the writers club, Amnesty International, Liberal Party and who knows what else. Some people found my mum difficult, and she could be difficult, but she acted out of love. Her passion about issues was so strong she had no time for diplomacy or persuasion, but launched into a lecture about why you should do this about that. Famously she was once caught on television berating Michael Portillo in the Bank Street about the then Government’s increase in the pension: "Tell me what I can by with these few more pennies." When the stroke slowed her down, her mind was still active and her love became more visible and less cluttered with her efforts to organise the world. On behalf of my mother, I want to express special thanks to the staff at Gala Nursing Home who took such care of her during her last years. The food they prepared and their care meant a lot to her. I want to thank the congregation of St Peters, and her friends who were so important to her. I want to thank my brothers Geoffrey and Marius, and my sister Ruth for everything they have done over the years. And above all I want to thank my sister Rosy and Dougie for the everyday love and support they gave her. My mother had great belief in the spiritual world, which helped her throughout her life and to which she was ready to return. But she also believed passionately in this world, in doing what she thought was right and best for people. She suffered a lot, and saw a lot of suffering, but in the end she could see through the suffering to what was really important. This is a moment to take a long view, a moment when living memory spans two centuries. I can remember my mother’s mother and father, and the stories they told about life before the first world war and life at the end of the nineteenth century. My son Orlando might live to the 22nd century and tell his grandchildren about this moment when we said goodbye to Granma. and above all, about how we bring up our children to take responsibility after we pass on. My mother had all of these in abundance. She also had a lot of clutter, paper and stuff. In that she took after her father. But in the end what mattered was her love of people and of the world, as well as her sense of a spiritual realm to which she has returned. I feel so privileged to have had Sibylle as a cousin - (her mother was my father’s sister). Although a cousin, she was of course much older than me, due to my father marrying very late in life. When my father died in 1959, Sibylle faithfully maintained contact with my mother Gwen. After mum died in 1967 (I was then aged 11), Sibylle wrote to me regularly and without fail for over forty years. I will treasure this collection of her wonderful letters for the rest of my life. 1. She connected me to my family on my father’s side and built an awareness over the years of that family and the heritage and sense of identity it gives. Without this, I could very easily have lost those connections, as after my parents died I had hardly any relatives from that side of the family here in far-away Australia. 2. Through her letters, she expressed her love and cared for me and made me feel special. Keeping up this correspondence over so many years is an act of incredible faithfulness. 3. Most importantly, she prayed faithfully for me and my family. Sibylle was the most wonderful writer I have known. Her letters were a rich tapestry of family news and photos, wisdom, advice, spiritual teaching; and of course social and political commentary! Her wisdom and insight I’m sure was shaped in no small way by some of the terrible experiences she lived through during the second world war. It seems to me that not only was Sibylle an incredibly strong force in shaping and nurturing her wonderful family, she was active in writing, story-telling, the church, the community, social commentary and a whole range of other things. It is indeed rare to find someone who posses all these gifts. I am so glad to have travelled to Edinburgh to see her, Robin and the family - first in 2000 and then in 2002 with our three children. I wish I had made the time to visit again in recent years. Her passing is a solemn reminder that we can be so busy in life doing the urgent things that we postpone the important things. Sadly, our time on this earth will end for all of us at some point; and for Sibylle this is God’s timing. Her passing is incredibly sad, and I feel much grief as I’m sure you do; but this time is equally a celebration of her wonderful life. I am confident she has now entered eternal life and is with Jesus in paradise - and we look forward to the time when we shall be reunited. Solutions for towns, cities, regions, communities, organisations. Suite 2, 1386 Toorak Road Camberwell, Victoria 3124, Australia. Thank you for this. We are very sad at the Storytyelling Centre to hear of Sibylle's passing. She was a great contributor and presence with her own strong and distinctive vision and experiences. I apologise that I arrived late on Saturday and was not able to get into the service. We will remember Sibylle with love and affection and send our condolences. I am very sorry to hear of your mother's death. I think she was one of the best mothers I have ever known. I remember well how she cared for you all when you were small and how she encouraged you along your individual paths. We will all miss her. As you know I am in Italy and it will not be possible to attend the funeral. I was so sorry that you're mother passed away and I send you my love and sympathies. You're Mother was a remarkable woman, such stature, such strength in all her beliefs and understandings. She was a very individual woman who carried herself with such dignity and beauty. Dominic was deeply moved by her ceremony and I was glad he was able to attend. Sibylle Alexander knew what real suffering meant. Her life in Germany under Hitler’s brutal Nazi regime had seen to that. It was that experience that let her see through to what was really important in life and that, put simply, was love – the love and compassion for other human beings and for the world around us. A resident of Galashiels for many years, Johanna Sibylle Kaufmann was born on January 24, 1925, and was the fourth child of five born into a marriage that brought together two old north German families – although one brother died before Sibylle was born. Her mother, Rita Tesdorf, was the daughter of a sea captain from the Baltic, from the famous Tesdorf family in Lubeck, while her father, Johannes Kaufman, was the only son of an eminent history professor. There was another significant connection as one of Sibylle’s relatives had married one of the famous storytelling Brothers Grim, who were an inspiration to her and her own storytelling. Sibylle’s father became a labour judge in Hamburg, arbitrating in industrial disputes, and the family lived in a large house on the outskirts of the city, with servants, a big garden and lots of freedom. Sibylle was eight when the Nazis came to power. Her father’s liberal political beliefs cost him his job, with the result that life became very hard for the Kaufmanns. But Sibylle was still able to enjoy a happy childhood because of the protection and encouragement of her parents. Apparently they did not allow Sibylle to do any housework, cooking or chores, all of which her mother did, because they wanted Sibylle to study and have the opportunities her mother never had. It was her experiences of war that strengthened Sibylle’s deep commitment to liberalism, peace, freedom and understanding between people. These were not slogans to her, because she had seen first hand what the opposite looked like. The war brought hardship and grief. Sibylle was forced to work in a munitions factory and her beloved older brother Georg, and sister Margaret, were killed. Aged 20 when the war ended, Sibylle made her way to Sweden where she joined a one-year programme, run by the Lutheran Church, to train as a youth leader and learn how to live in a democratic community. She returned to Germany to study theology, philosophy and literature in Tübigen, and it was there, in 1949, that she met Robin Alexander, from Newcastle. He was also studying philosophy as one of the very few non-military British people in Germany at that time. In Tübigen, the couple saw happy and joyful children coming home from school, and they wanted to know what the secret was. So one day Sibylle followed them and discovered Waldorf education, Rudolf Steiner and anthroposophy, which would become the guiding light for the rest of her life. The Alexanders studied Steiner’s philosophy on education and, after moving to Edinburgh, began teaching at the Steiner school in the Scottish capital. The couple’s two sons, Marius and Titus had been born while they were in Germany and son number three, Geoffrey, was an unexpected surprise a few months after they arrived in Edinburgh. For several years, the family lived in a small farm cottage at Fairmilehead. Sibylle and Robin did their teacher training at Moray House and taught briefly at the Steiner school. By this time the couple were in their 30s, had little money and relied on child benefit, their own vegetable patch, bee hives and Robin’s ability to shoot wood pigeons and rabbits to survive. 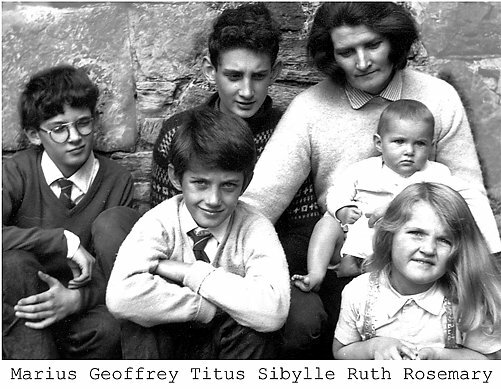 The family soon grew to five children with the arrival of Rosemary and Ruth. 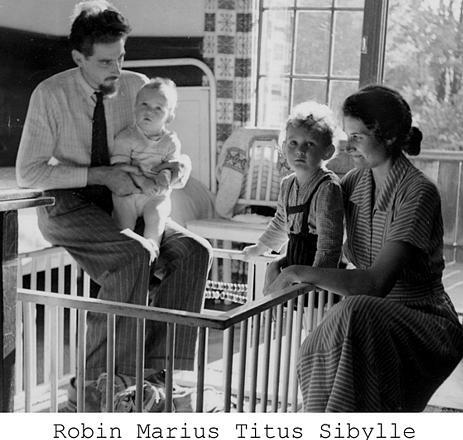 While Robin wrote and contributed to the Edinburgh poetry scene, Sibylle threw herself in the role of housewife and mother, as well as managing to find time to teach German and write her own stories. With help from her father-in-law, the Alexander family was able to move to Morningside, where Sibylle campaigned tirelessly for nature kindergardens for young children and to raise the school starting age to six. In her later years, Sibylle developed an extraordinary career, which consisted of writing articles, book reviews and letters to newspapers, giving talks on Celtic mythology and other subjects, mainly in Germany, and selling bits and pieces of tartan fabric. Wherever Sibylle was, she became deeply and passionately involved in what was going on. She was not one of life’s observers, content simply to stand on the sidelines and do nothing as the world went by. In Edinburgh, she was involved in the Allotments Association, in the school and activities such as the Psychic Society where she lectured. In the Borders, she was involved in the writers club, Amnesty International, the Liberal Party and many other things. Some people will have found Sibylle difficult. But that was because she acted out of passion for a cause and had no time for diplomacy or gentle persuasion when there was an important issue at stake. It was a lesson she had harshly learned during the Nazi years. She was caught on television on one occasion berating Conservative Party politican Michael Portillo in Bank Street, Galashiels, about his Government’s increase in the pension. “Tell me what I can buy with these few more pennies,” she famously asked him, unfazed by his lofty position or the presence of government minders. Her husband, Dr Alexander, died in 2005, and although a stroke would eventually slow her down, Sibylle’s mind remained active and her love for family and the world around her was undiminished. She spent the last two years of her life as a resident at Gala Nursing Home, but managed to get out each Sunday to attend the regular service at St Peter’s Episcopal Church. Sibylle’s Christian faith had been a bulwark throughout her life and it was while coming out St Peter’s on August 14 that she died, at the age of 86. At St Peter’s on August 19 Sibylle’s family and many friends, including local MP and Secretary of State for Scotland Michael Moore, packed the pews and aisles for her funeral service. A mother of five, grandmother of 13 and great-grandmother to Mimi, Sibylle Alexander’s life touched and changed for the better many others. I read in the Southern that your mother had passed away and I would just like to add my name to the list of the many people who have fond memories of her. Your mother welcomed me as a new member to the Borders Writers' Forum and was always supportive and encouraging to me especially after I took on the Secretary role of said organisation. I have nothing more to add to the article in the Southern except to say that your mother's life was an inspiration to us all and I am so glad now that she was able to give her talk to the Forum about life in Germany under the Nazis.